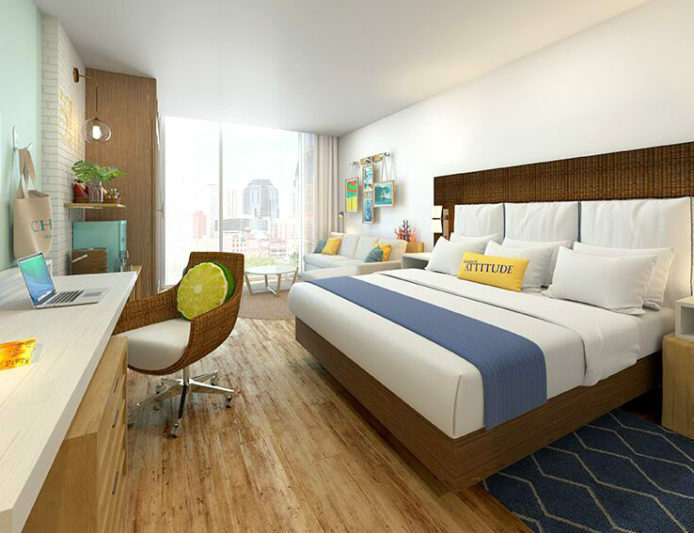 Margaritaville Nashville Hotel, a 217-room new-build hotel perfectly positioned in Nashville’s thriving “SoBro” district, celebrated its groundbreaking earlier this week. A festive event took place on Tuesday, December 5, welcoming nearly a hundred attendees for the milestone moment, including representatives from Safe Harbor Development and Margaritaville Holdings, as well as local members of the tourism industry. During the groundbreaking celebration, attendees enjoyed Southern cuisine, Who’s to Blame margaritas and Margaritaville’s island-style LandShark® Lager, stilt walkers, and a solo guitarist. A program of remarks featured Campbell, as well as John Cohlan, chief executive officer of Margaritaville Holdings and Dusty Tonkin, EVP, Sales and Marketing at Wyndham Vacation Ownership. There was also a special appearance by Kirsten Winquist, on-air host and program director of SiriusXM®’s Radio Margaritaville, who conducted interviews during the event. Centrally located just steps from the Music City Center at the corner of 5th Ave. S and Peabody St., Margaritaville Nashville Hotel will feature 217 guestrooms; 52 Margaritaville Vacation Club® by Wyndham timeshare units; a rooftop relaxation and entertainment area with a pool, sundeck, fire pits and live entertainment; a fitness center; more than 10,000 square feet of function space; a Starbucks® coffee shop; and two new Margaritaville dining concepts – FINS Beach Bar and JWB Grill. The property is anticipated to open in Summer 2019 and will be the first Margaritaville Hotel in a metropolitan area.